The coated bass strings are designed for players who want longer lasting strings and as great a tonal range as some of the greatest professional musicians. 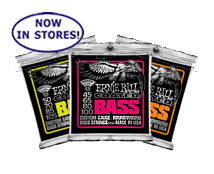 Ernie Ball’s coated bass strings offer extended life and great playability utilizing the same Nickel alloy of our most popular bass strings. An ultra thin layer of Ernie Ball’s exclusive enamel coating protects the strings and preserves their bright sound, while retaining the natural feel of uncoated strings. Available in Super, Hybrid, Regular and 5 string etc. Chris Cornell, Steve Vai, Mars Volta, Steve Lukather, Bruno Mars, Paul McCartney, Eric Clapton, Jimmy Page, Slash, Keith Richards, Angus Young, Paul Gilbert, Genesis, John Petrucci, Jack White – The Raconteurs, Maroon 5, Steve Morse, Collective Soul, Blink 182, Guns And Roses, Eagles, Muse, John Mayer, Jeff Beck, Aerosmith, Kirk Hammett, Limp Bizkit, Green Day, System of A Down, Avenged Sevenfold, Pete Townshend, A Day To Remember, Against Me!, Anberlin, Kenny Chesney, Miranda Lambert, Sugarland, Brad Paisley, Rascal Flatts, Kelly McGrath, Automatic Loveletter, Brett Dennen, Dirty Heads, Peter Frampton, Nine Inch Nails, Chris Broderick-Megadeth, Nevermore, Breaking Benjamin, All That Remains, 12 stones, 311, Sublime With Rome, The Expendables, Albert Lee, Depeche Mode, Flogging Molly, The Darlings, Buckcherry, Paramore, Gardening, Not Architecture, Billy Duffy-The Cult, Rise Against, Iron Maiden, NOFX, Rick Savage-Def Leppard, Sonic Youth, Sevendust, Glenn Tipton-Judas Priest, Thrice, Buddy Guy, Blues Saraceno, Joe Bonamassa, Tony Levin, Kenny Wayne Shepherd, Annihilator, Counting Crows, Escape the Fate, Apache Beat, MGMT, The Scissors, Wallflowers, Tony MacAlpine, Bullet For My Valentine, Cobra Starship, Dave La Rue, Dengue Fever, Don Felder, Micah Brown, Hinder, John Fogerty, John Sykes, Millencolin, Sharon Aguilar, Malina Moye, Manchester Orchestra, I See Stars, Nickelback, The Devil Makes Three, The Edge, Stars Go Dim, Super Geek League, Hostage Calm, Needmore, Tyler Hilton.